I think I am pretty good at reading my wife. I know when she is hungry, upset, happy, anxious, and I think I have a pretty good idea of what she really loves to eat. She gets me to, but in so many different ways. I know that I am the cook in the house, but I think I am so much more than that. Sure yesterday I rocked out homemade crepes for my wife, a Thai curry fish recipe, as well as a Thai beef salad that I knew would be a bend to her knees on first taste, but I also think that I provide some other good things such as a great sense of humor, a good hug, and an emotion and discipline to guide my kids through their early times in life (and hopefully much longer than that). My wife has introduced me to things, or maybe reintroduced me to things, that I would have probably never had ever wanted again, and this recipe is one of those. 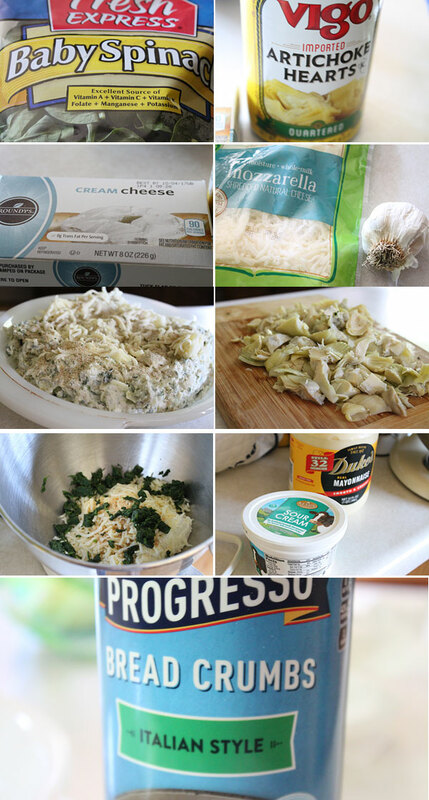 It’s the classic spinach and artichoke dip. This is one of those dips that she fell in love with back in the late 1980’s, or early 1990’s at the chain TGIF. It’s that iconic image when opening their menu back then. 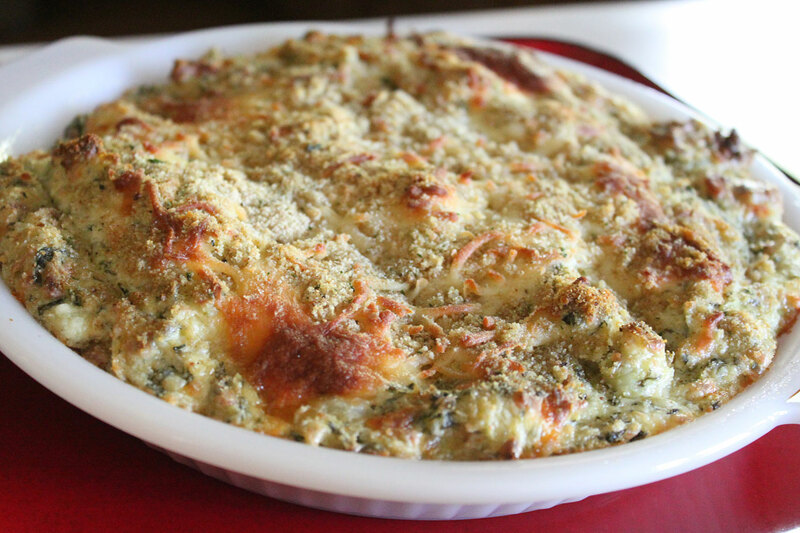 The spinach and artichoke dip. Heck, we even recall going out to eat there when I returned home (I wasn’t going to say no) and sure enough that was ordered as an appetizer. As I have been home or a couple of weeks, I have been purging things in my refrigerator and cupboard (and doing a pretty good job at it), and this was a perfect creation to use up a can of artichokes, cheese, breadcrumbs, mayo, sour cream, and a bag of spinach my kid was so gung ho to use up for lunch. Do you think he touched the spinach? No. This recipe is way too easy. The hardest part is probably waiting. Waiting for the spinach to cook and cool, or the dip to be cooked and ready. Seriously. Start by adding the spinach to a pot. Add in the water and bring this to a medium heat. Basically cook down the spinach until softened, only a few minutes, then strain, press out all of the water, and let it cool. During this time, get a mixing bowl. If you want to use your electric mixer feel free. Add in the chopped artichokes, half of the cheese, mayo, sour cream, garlic, and salt. Give this a good spin or mix. Yes, we are still waiting on that spinach to cool. As we wait, preheat your oven to 400 degrees and get your casserole dish out. OK, now that the spinach is cooled, and chopped, toss this into the mixing bowl, and give another good mix. Scoop the mixture into the casserole dish, add the remaining cheese to lightly cover the top, then sprinkle on the breadcrumbs. Place in the preheated oven and cook for about 25 minutes or until that top is nice and golden and bubbly. Get ready. You know that molten hot dip you know you shouldn’t dig into but can’t resist? Yeah, this is one of those. This dip is a crowd pleaser. It’s best served right out of the oven, scorching hot, or warmed. As much as my wife loves it, I will admit that I like it to in moderation. With that said, it’s a dip that is hard to walk away from. You might say things like ‘That’s it for me’, ‘I’m out’, ‘Get that away from me’, but one thing is for sure, I will find you coming back for another swipe of a veg, cracker, or chip. Yep, it’s that good. I hope you enjoy!